CGN-208D Semi-automatic Capsule Filling Machine integrating machine, electricity air, it adopts micro-computer PLC control with touch screen panel operation, it adjusts the speed by frequency conversion, equipped with electric auto counting device to complete the placing, separating, filling and locking for capsule respectively. 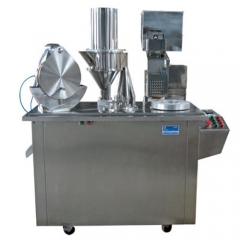 So it can decrease the working and increase the working efficiency, this kind of machine meets the requirement of pharmaceutical sanitary, it is suitable for filling powder and granular material in pharmacy and health food industry into capsule. With electric auto counting device to decrease the working intensity and increase working efficiency. Automatic complete placing, separating, filling and locking for capsule respectively. Exactly filling, novel structure, beautiful appearance and easy operation. According with requirement of pharmacy sanitary.